Advantages: Excellent research, very readable, superb colour artwork. For those of us lucky enough to have Part I in this series, its long awaited companion is now available. The format is the familiar 96 pages, which contain 102 black and white photos, and 14 pages of artwork. The authors are well known in the field of World War I aviation research and their collaboration on a book such as this is most welcome. Whereas Part I covered the aces of Jastas that formed part of the four Jagdgeschwadern, this book deals with those that formed non-permanent groupings called Jagdgruppen. These units were usually created for specific purposes and as such were only together for a limited period of time. Each chapter covers a particular Army, its front and the Jagdgruppe associated with it. For example, the first section is devoted to the 4th and 6th armies. They had Jagdgruppe Nr 6 and Nr 3 attached to them respectively and operated in areas from the Belgian coast to Ypres and from Lille to Douai in northwest France. This is also where we find the colourful aircraft of the Marine-Feldjagdstaffeln. They were based in Flanders where the 4th Army was operating. Chapter 2 deals with the 17th, 2nd, and 18th Armies, their assigned Jagdstaffeln were mostly fighting the RAF. The third chapter sees the French and Americans getting involved; fighting with units attached to the 7th, 1st, 5th, and 3rd Armies. The narrative concludes with a chapter on the Kest (home defense) pilots as they fight the RAF’s Independence Air force, which was tasked with bombing operations in southwest Germany. One of the highlights is the artwork of Harry Dempsey, who always seems to do his best work when painting German subjects. His profiles are not based on a generic D.VII airframe but faithfully portray the subject as seen in a photo, when available. The text is very easy to read with plenty of extracts from diaries and “letters home” to give the reader a more personal feel. An interesting selection of photos is provided with captions that compliment the text rather than repeat it. A set of plans for the Fokker D.VII can be found in the appendices and these have been printed in 1/32nd scale. One thing I would have found useful is a map showing the general areas of operations of each of the Jagdgruppen. Norman Franks and Greg VanWyngarden have done a sterling job in this series. 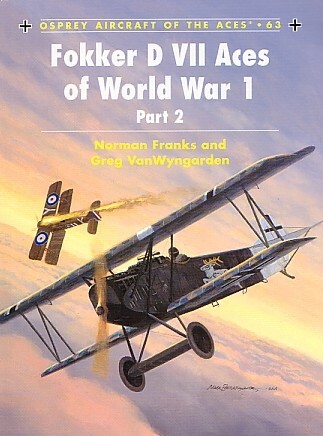 The Fokker D.VII was one of the best aircraft to have fought in WWI and with this latest book the reader gets an excellent overview of the aces that flew it.